Lobster is always a daily dish for any housewives, as its nutritious ingredients and easy-to-make method makes it a kitchen favour. Enjoy! Sauteed onions with fresh thyme, deglazed with cognac and add half of lobster bisque. Reduce, add cream and mustard. Cooked until a bit thick. Take out of fire and add eggs yolk. During the process, mixed lobster meat with recipe above and parsley. Whisk white eggs with remaining lobster bisque. Put back meat in shell with mushrooms, cover with white eggs base and parmesan cheese. Add to salamander until the crust is right. 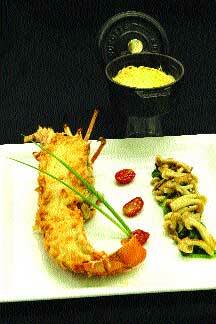 You can sample the dish at Sofitel Legend Metropole Ha Noi, 1 Ngo Quyen St, Hoan Kiem Dist, Ha Noi. Tel: (+84) 4/38266919.